Just a few months after debuting its Diver Chronometer 44mm Collection, Ulysse Nardin now unveils Diver Chronometer 42mm, a retro-styled selection of seven slightly smaller dive watches that retain sea-worthy specifications. 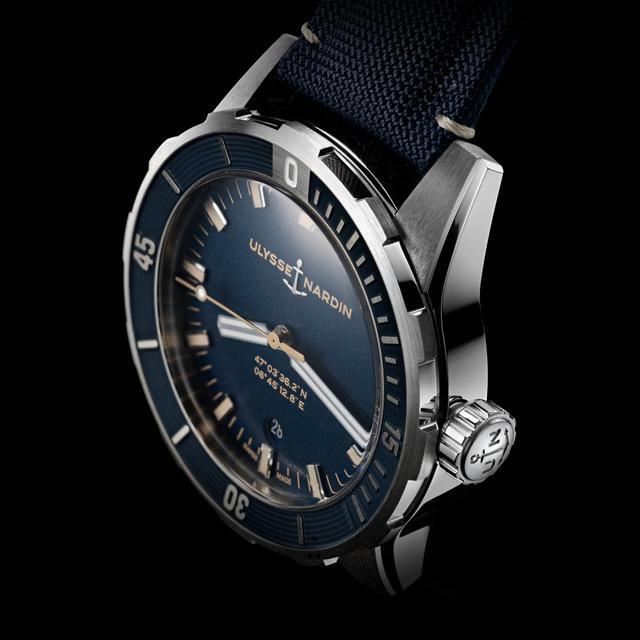 The retro-inspired Ulysse Nardin Diver Chronometer 42mm watches come with blue or black dials. Ulysse Nardin, historically a maker of nautical timepieces, maintains a 300-meter water resistance rating for all these new watches and continues to woo true dive watch collectors with requisite high luminosity on the hands, on the unidirectional rotating bezel and on the 0. 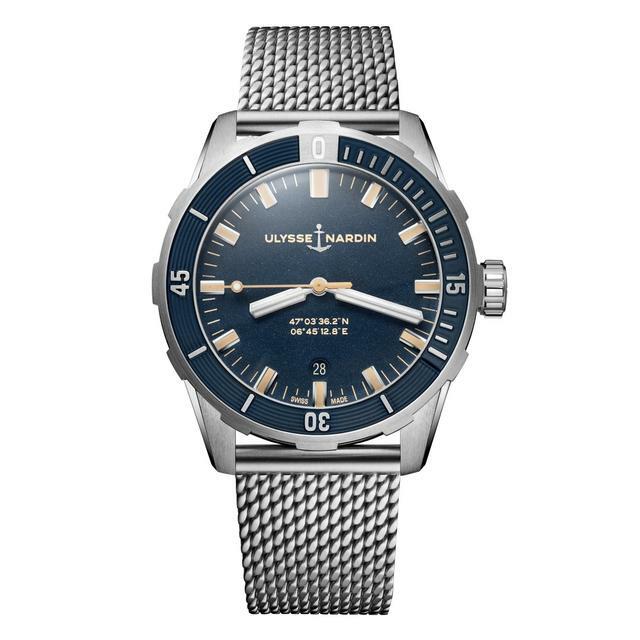 These Ulysse Nardin Diver Chronometer 42mm watches, with blue or black dials, come with a selection of strap options, including blue fabric, black leather, three-row steel or, in a first for Ulysse Nardin, a stainless-steel Milanese mesh bracelet. The Diver Chronometer 42mm watches come with a selection of strap options, including blue fabric, black leather, three-row steel or, in a first for Ulysse Nardin, a stainless-steel Milanese mesh bracelet. Since this is Ulysse Nardin, the company that pioneered the use of silicon in watch movements, each 42mm steel watch is powered by automatic caliber UN-816, which is based on a Sellita caliber, yet also utilizes Ulysse Nardin silicon components. Each watch is a three-hand model, which differs from the dials within the larger (44mm) Diver Chronometer Collection that debuted this past summer. But the new collection does share the Chronometer 44mm’s concave bezel and domed sapphire crystal design. The new Ulysse Nardin Diver Chronometer 42 boasts a clean dial design, with a hint of beige and a central seconds hand. The Diver Chronometer 42mm, now the brand’s entry level dive watch collection, boasts a cleaner dial design, with a hint of beige and a central seconds hand instead of a small second counter. Ulysse Nardin says the dial, which prominently features the GPS coordinates of Le Locle, the manufacturer’s hometown since 1846, was inspired by a 1964 Ulysse Nardin Diver Le Locle. The dial text is a retro touch that will particularly endear the watch to geekier collectors. I like it. 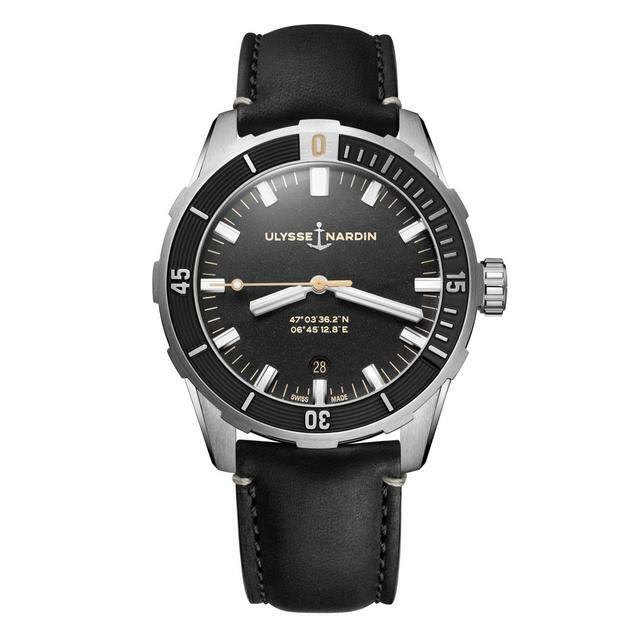 The Ulysse Nardin Diver Chronometer 42mm dial design prominently features the GPS coordinates of Le Locle. 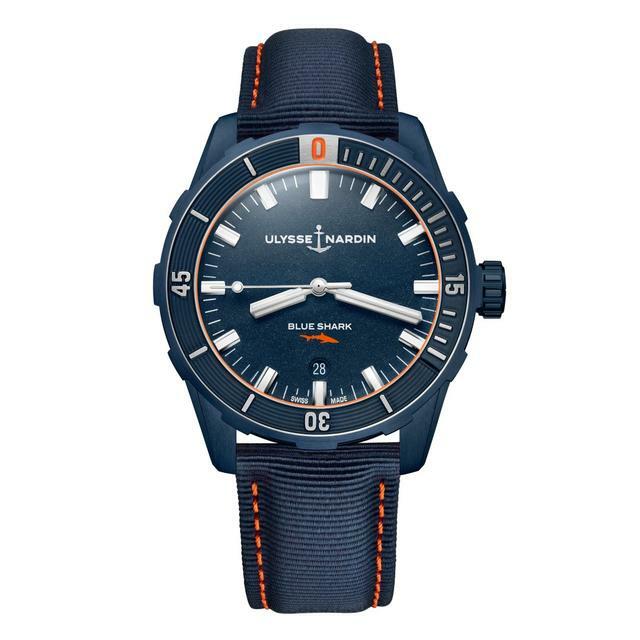 On one model, the Diver Blue Shark Limited Edition, the dial is different, but in another way. In place of the GPS coordinates you’ll find an orange shark silhouette. This new watch also differs from the others with its blue dial framed by a blue PVD bezel, orange accents and a blue strap. The 300-piece limited edition also features a blue shark engraving on its caseback, echoing the look of the Ulysse Nardin Diver Great White 44mm that debuted earlier this year. Ulysse Nardin explains that for its debut mesh bracelet, the manufacturer has opted for a very thick mesh, stamped from sheet steel, stitched together by hand, and finished with a retro-styled butterfly buckle. The new collection represents a stylistic departure from the brand’s larger, more contemporary dive models. The retro-look is, ironically, fresh for a forward-thinking manufacturer like Ulysse Nardin. I don’t expect this company to look back too often, but in this instance the historic inspiration seems to have served them well.